The Rialto is a phonostage pre-amp compatible with both moving magnet and low output moving coil cartridges. Discrete transistor circuitry is used throughout for maximum fidelity and lowest noise, and audiophile polypropylene capacitors are used for both the RIAA equalisation and signal coupling. Although this is our first new phonostage for several years, phonostage design is nothing new to Rothwell. 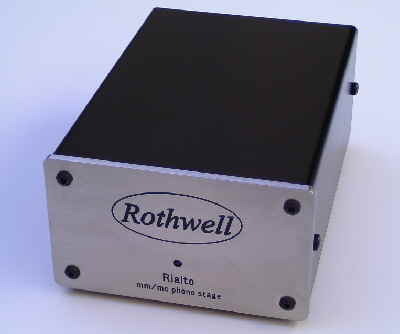 The first phonostage to bear the Rothwell name was designed as far back as 1989 and was debuted at the London Hi-Fi Show of 1990 (it was an expensive valve design with many of the features subsequently adopted by other manufacturers, like a large outboard power supply and selectable cartridge loading). Since then there have been solid state moving coil and moving magnet designs from Rothwell, some sold as Rothwell products and some designed for third parties. More than twenty years of design experience has lead to an understanding of what really makes an impact on sound quality and what merely looks good on paper (or indeed just adds to the cost). The goal when designing the Rialto was to achieve high-end performance without the high-end price tag. To this end, every effort was put into maximising sound quality and everything that has no bearing on sound quality was sacrificed. For example, the ability to switch between mm and mc modes of operation via an external switch might be convenient, but internal switches allow the signal path to be kept as short and direct as possible, so internal switches are what were chosen. There's even a separate switch for each channel to keep the left and right signals separate and signal paths short. The gain and input impedance for mm and mc operation could have been made adjustable, but that would have been an unnecessary expense for virtually no benefit in terms of sound quality, so fixed values for gain and input impedance were chosen (42dB and 47k for mm, and 62dB and 100 ohms for mc). The budget saved on unnecessary adjustability is better spent on power supply filtering - seven stages in total are used in the Rialto to maximise channel separation and inter-stage separation. Even the power on/off switch was deemed unnecessary since the total power consumption is so low (less than most domestic equipment in standby mode). 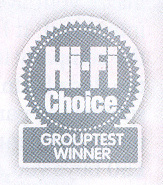 The result is truly audiophile sound quality at a very affordable price. Although op-amps can give excellent performance and certainly boast impressive specs, they aren't designed specifically for the ultra low signal levels of moving coil cartridges which are typically in the region of a few hundred microvolts. The lowest level signals which an mc phonostage has to handle can be less than a single microvolt (the tail end of the reverb is 60dB below the peaks), and signals this low are best handled by circuits designed for the job. It’s a little known fact that op-amps have class AB, or even class B, output stages which rely on large amounts of negative feedback to minimise crossover distortion. Having a class AB output stage allows an op-amp to swing large signal voltages into low impedance loads whilst maintaining modest quiescent current drain, and although op-amps excel with input signals of 20 volts or more where residual crossover distortion from their class AB output stages pose no problem, handling signals of a few microvolts is another matter. So, discrete transistors were chosen for the Rialto. The moving coil gain stage is based around low noise discrete transistors and designed to amplify the delicate signal produced by a moving coil cartridge with maximum care, operating entirely in class A to eliminate crossover distortion without resorting to negative feedback (there is no crossover distortion in a class A amplifier whether negative feedback is used or not).The moving magnet section of the Rialto also uses discrete transistor gain stages. A moving coil phonostage typically has a gain of about 60dB, but due to the RIAA equalisation curve it actually has more like 80dB at the low end of the audio spectrum. 80dB is huge amount of gain and is best spread over more than one gain stage. Many designs employ two gain stages, but the Rialto has three to allow each gain stage to operate with optimum performance. Each gain stage uses just two discrete transistors and employs local feedback to achieve extremely low distortion. The high linearity of each gain stage means that overall global feedback (widely acknowledged to be good for achieving good THD figures but bad for perceived sound quality) can be eliminated. The Rialto uses a passive circuit to create the RIAA curve (accurate to better than 0.5dB) and employs multiple audiophile grade polypropylene capacitors which not only allows non-standard capacitance values to achieved (to obtain the accuracy in the RIAA curve) but also to act as mutual bypass capacitors, minimising ESR (equivalent series resistance) and maximising audio performance. The transistors too are audiophile devices, carefully selected for maximum fidelity and minimum noise. Different transistors are used in the moving magnet section of the Rialto and the moving coil section so that both moving coil and moving magnet cartridges are amplified by gain stages optimised for their specific requirements. Low noise cannot be achieved merely by using expensive components. The circuit design has to be right and the circuit board tracks have to be very carefully routed. Both these aspects of design have been meticulously addressed in the Rialto so that background noise is as low as possible. The power supply goes through seven stages of filtering so that the circuit is operating from a perfectly clean voltage supply, allowing the music to appear out of silence, unsullied by residual hum, buzz and hiss. Don't be fooled by the Rialto's affordability. This is a top-flight phonostage. For anyone new to turntables and confused or unsure of what is required in terms of electronics to start playing vinyl we have written a short guide to explain the basic requirements. This simple guide let’s you know what you need and why you need it. click here. For audiophiles looking for future upgrades, we don’t recommend the usual path of changing to a larger power supply. A power supply capable of delivering more current is of no benefit to a class A circuit which draws constant current, and the extensive supply filtering and storage within the Rialto means that changing the power supply would yield only marginal benefits. For audiophiles looking to get the absolute best performance from a moving coil cartridge, we recommend using a step-up transformer in conjunction with the Rialto in moving magnet mode. This will push the Rialto’s performance from Hi-End standard into the Super League. The cost is £379 (uk retail) and units can be obtained from our hi-fi dealers (full list) or by contacting Rothwell Audio Products directly by email or telephone (+44 (0)1204 366133) or from the online shop.